As one might have expected when the Wall Street Journal published its first report about President Donald Trump’s 18-month-long extramarital relationship with former adult film actress Stormy Daniels - aka Stephanie Clifford - the scandal has somehow become wrapped up in Special Counsel Robert Mueller’s sprawling investigation into collusion between Trump and the Russians (or obstruction of justice, or Trump’s business conflicts…). We learned as much earlier today when we learned that Special Counsel Robert Mueller is zeroing in on Trump lawyer Michael Cohen, the president’s longtime fixer who testified that he paid Daniels’ lawyer $130,000 out of his own pocket in exchange for her signing an NDA about her relationship with Trump, per NBC News. That news broke earlier this evening, and already, another twist in the ongoing saga of Stormy Daniels, the adult actress-turned-soccer mom who has scarcely left the headlines since making the initial round of media interviews (In Touch magazine even published a detailed 5,000-word interview with Daniels that it didn’t run back in 2011. Though she by all accounts kept her share of the $130,000 payout, Daniels is suing President Trump in Los Angeles, arguing that her NDA with the president isn’t valid - because he never bothered to sign it. In the suit, Daniels’ lawyer alleges that his client has been harassed by Cohen as recently as last month over her decision to come forward with her story. Cohen has reportedly sued Daniels for breaking the agreement. Trump has never addressed the alleged relationship publicly, and White House spokesperson Raj Shah told members of the press he had never asked the president about the alleged relationship. Cohen has acknowledged the payment, but has repeatedly declined to tell NBC News what the payment was for. Clifford had previously given conflicting accounts of her relationship with Trump. In the lawsuit, Clifford alleges that in January 2018, Cohen, "concerned the truth would be disclosed ... through intimidation and coercive tactics, forced Ms. Clifford into signing a false statement wherein she stated that reports of her relationship with Mr. Trump were false." 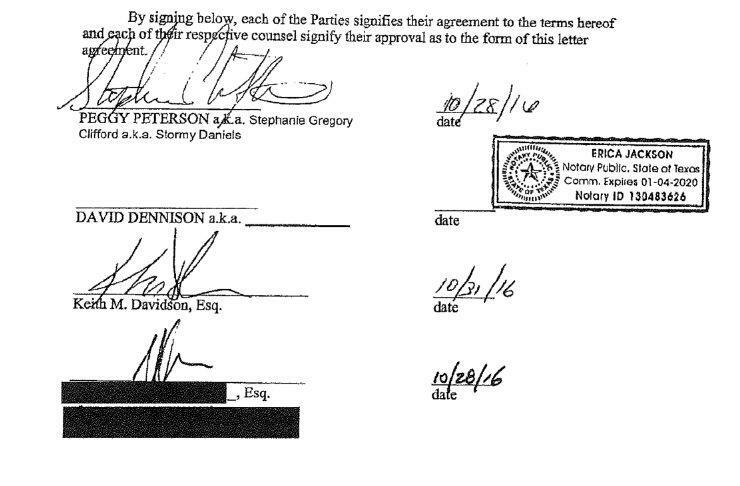 The "hush agreement," as it's called in the suit, refers to Trump throughout as David Dennison, and Clifford as Peggy Peterson. The side letter agreement reveals the true identities of the parties as Clifford and Trump. To hear Daniels tell it, Cohen sounds like a vicious fixer determined to do his boss’s bidding no matter what - an impression that some of his more brazen dealings, like the time he emailed Felix Sater, a Trump associate with links to Russian crime groups, about how they could sway the election and get Trump elected. Cohen is also a member of the legal team representing Trump in the various Congressional investigations and the Mueller probe. Trump has never publicly commented on the Daniels allegations - though the White House comms department has denied them. We wonder: Will we finally hear from Trump? (perhaps even in the form of a tweet).